Sun Records was rock and roll and blues... and country music. When Sam Phillips opened is studio in 1950, he began with country music, and continued recording country music until the end. In the years between, he discovered one of the greatest country stars of all time, Johnny Cash. These recordings, made at the original Sun studio between 1950 and 1959, capture the changing complexion of country music. Many of those changes were ushered in by Sun Records itself. Elvis Presley began on Sun as a country artist, working with Scotty Moore and Bill Black, recruited from another Sun country band. Carl Perkins came to Sun as a country artist, as did Jerry Lee Lewis. This set includes 6 CDs and a total of 208 songs. Elvis Presley, Johnny cash, and Carl Perkins are here... and so much more. There's Harmonica Frank – a country musician playing blues and medicine show tunes, Charlie Feathers making his greatest ever records, Malcolm Yelvington blending western swing and rockabilly, The Miller Sisters whose pure country harmony never found the audience it deserved, Cast King, whose stellar recordings weren't even issued in the 1950s, Warren Smith – one of the greatest-ever country voices from Sun Records, Ernie Chaffin singing the great Pee Wee Maddux's songs, Nashville's resident genius Jack Clement, and many more. 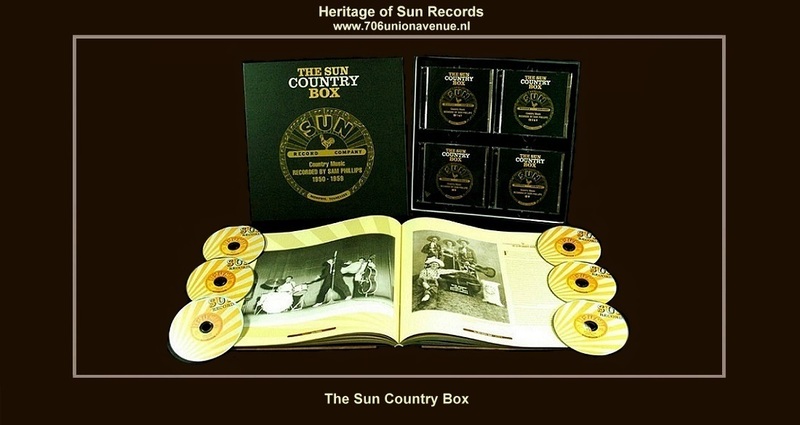 First released on LP in 1986, The Sun Country Box, includes all the original recordings and more. It also features new essays and newly-discovered photos in a 148-page, LP-sized hardcover book authored by Hank Davis, Colin Escott, and Martin Hawkins.